Senet games were often found in the tombs of ancient Egyptians. The Senet game board is made up of a grid of 30 squares, 3 rows by 10 columns. The actual rules of the game are unknown, but their have been many suggested theories as to how it might have been played. Mark Twain created a board game, which he called Mark Twain’s Memory Builder. He patented this game in 1885. The game of Clue was invented in 1944, by Anthony Ernst Pratt. The victim in the game is a Mr. Boddy. Mr. Boddy was killed in a mansion that has nine rooms. There are six possible weapons and six suspects. It is up to the players to figure out who killed Mr. Boddy. In North America the game is known as Clue but in other countries it is called Cluedo. Cluedo or Clue can be found in 40 different countries world wide. The one mystery about the game is Why was Mr. Boddy Killed? Trivial Pursuit was invented by Chris Haney and Scott Abbott. They are both Canadian. The game was first sold in 1981. When the game hit the US market in 1984, it sold a record breaking 20 million copies. The first board game published in the United States was The Mansion of Happiness. The game was created by Anne Abbott in 1843. The game was built around the views and principals of a Puritan society. The game did not use dice because they were considered to be satanic, instead it employed a spinner. 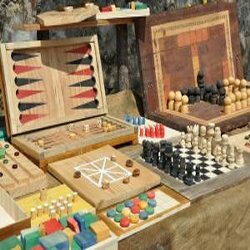 Parcheesi is an adaptation of an ancient game created around the year 500 BC. It is often called the Royal Game of India. It was played outside in a large courtyard using harem girls as the game pieces. Home, in this version was the Emperor’s throne. Parcheesi is the national game of India. The most common version of this game has 72 spaces and uses four colours. The game can be played with two to four people, each controlling four pieces. The first person to get all their pieces home is the winner. The game of Risk debuted in 1957. The game was invented by Albert Lamorisse. Albert was a French film director. He originally called his game La Conquete du Monde which translates to mean the Conquest of the World. Risk was first produced by Parker Brothers. Risk is a strategy and luck game where players try to conquer the world. The game is played using cards, a special board of the world and 5 dice. This entry was posted in Game & Hobby Trivia and tagged board game facts, board game information, board game trivia, board games, fun game facts, fun game trivia, Game & Hobby Trivia, game facts, games by Jane. Bookmark the permalink.